There's only a few weeks left for summer to be officially over and truthfully I couldn't be sadder. I've said this more than a few times before but this summer has been the best summer yet. I'm not sure if it's because Ben is at the best age ever (he just turned 5!) and we enjoy doing so many things together or if t's because Emme is so amazing and independent and truly enjoys any and everything we've done this season. Whatever it may be, I know it will stay in my heart forever as one of many "best summers yet!". One of the things we have been doing that the kids loooove is doing little fun baths outside on their kiddie pool... yes! Emme loves "bathing herself" she is so independent she wants to do everything on her own, from eating, to dressing herself and of course bathing herself! If you saw my most recent video you know I raved about Johnson's Baby new line; it's the Johnson's Baby Head to Toe Extra Moisturizing Baby Wash + Baby Cream. 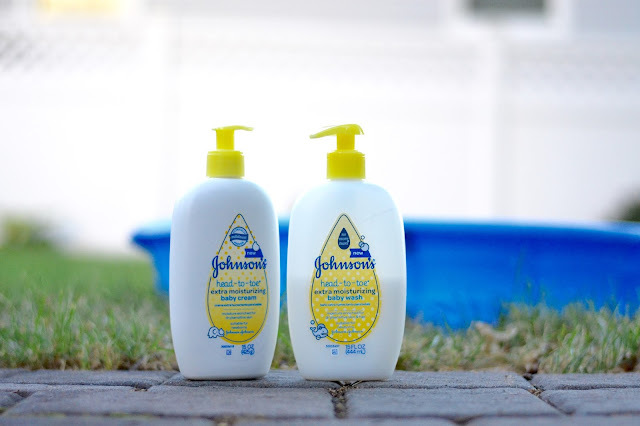 And for today's post I partnered with Johnson's Baby once again to share one of our favorite summer routines and that is bath time... outside! It's been so humid and the evenings have been so perfect for being outside in the yard so we've been taking full advantage of the last few weeks of the season. One of the reasons I love Johnson's Baby Head to Toe Extra Moisturizing Baby Wash + Baby Cream is because it is delicate to both Emme's and Ben's skin. Every child's skin is different and while Emme's is extra sensitive, Ben's is pretty normal and the products work just as great on both of them. I love that I can use one product for the two of them and know that it's protecting and nourishing their skin. Both the wash and the cream smell amazing, they feel so light and refreshing, I even use the Baby Cream on myself, daily! It moisturizes our skin for up to 24 hours. Babies are dependent on us, the parents, to teach them about the world... and the first sense they develop is touch. With Johnson's Baby I am not only protecting and taking care of their bodies and skin but also helping them develop their senses while enjoying a fun summer bath. I love the memories we are making this summer, these moments are so important in a child's life and essential for their development. This post is sponsored by Johnson's Baby. As always, all opinions are my own. Thank you for your support and love which makes these posts possible.